PennsylvAsia: Post-Gazette likes Ramen Bar; other reviews mixed. Post-Gazette likes Ramen Bar; other reviews mixed. Not Ramen Bar. 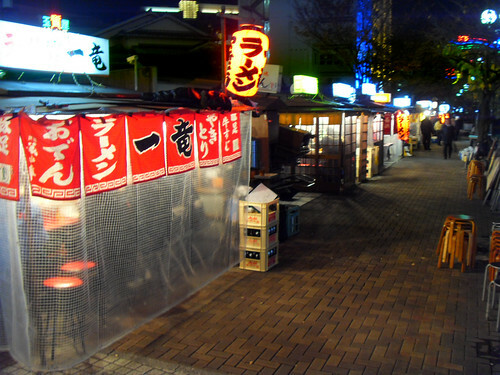 Ramen stalls in Hakata, Japan. The Post-Gazette's "Brunch" column wrote about "Ramen Bar" today and gave it a good review in an overall painful-to-read write-up. As the days grow colder, we often turn to liquid meals for convenience and comfort. But the ones at Ramen Bar won't induce you to call up any exes or give you a raging hangover. No, they might just be good for you. There are several reviews of Ramen Bar up on Yelp, which had a soft-opening in Squirrel Hill in November and had its proper opening last week. The thirteen reviews are mixed so far, and the restaurant has earned three out of five stars overall. For Pittsburgh I'd rate it an A-, as it's the only place in the city devoted to ramen. If it were in a larger city, though, it would earn a C and wouldn't be anything special. We're not diverse enough yet to be discerning, and we get fired up about small movements in the generally-right direction. It's still rather new, and is soliciting advice for improvements on its Facebook page, but the glaring omission of "tonkotsu ramen"---left off the menu because the pork-bone soup is cumbersome and was preemptively deemed unpopular in the Jewish neighborhood of Squirrel Hill---nearly defeats the restaurant's purpose. People may be short on patience, though, because they're writing on the internet it opened with some fanfare in a high-traffic area; diners were more forgiving of Teppanyaki Kyoto and its extended soft-opening in Highland Park in 2012.